This month, we continue our Food Lover’s Tour by exploring Aichi Prefecture! Aichi Prefecture is located in central Japan and is blessed with a natural landscape including a mountainous area full of lumber and rivers, the flat Nobi Plain rich with fertile agricultural land and the abundant fishing waters of Ise Bay, Chita Bay, Mikawa Bay and Atsumi Bay. 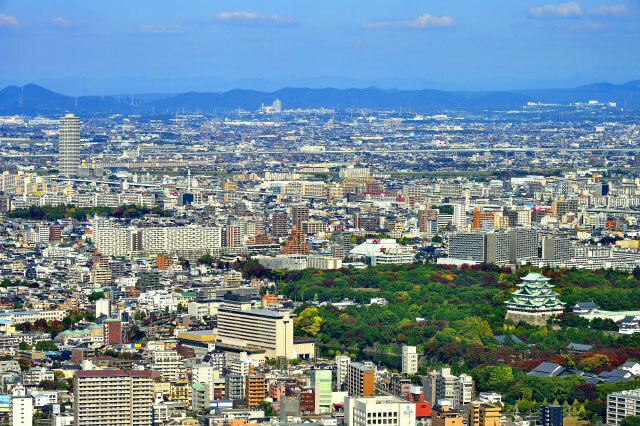 This naturally plentiful environment has led to the growth of many industries in Aichi Prefecture, and the third largest city of Nagoya, is strategically located between Tokyo and Osaka. In ancient times, Nagoya was controlled by the Tokugawa Clan, who built one of the most noted castles in Japan, and fostered native industries. Commerce was, and is, one of the largest activities in Aichi Prefecture, bringing many influences from different parts of Japan as well as other countries. Today, Aichi Prefecture is famous for ceramics, textiles and Toyota’s automotive manufacturing. Nagoya is the largest city in Aichi Prefecture, and is famous for this month’s special food: tenmusu. Tenmusu are rice balls stuffed with shrimp tempura that has been soaked in a savory sauce and then wrapped in sheets of nori seaweed. Tenmusu, comes from two words–tempura and omusubi–and brings both delicious items together in a wonderful dish. Tenmusu has a colorful history! It is associated with Nagoya, but it was originally developed in the city of Tsu, in the Mie Prefecture across Ise Bay. 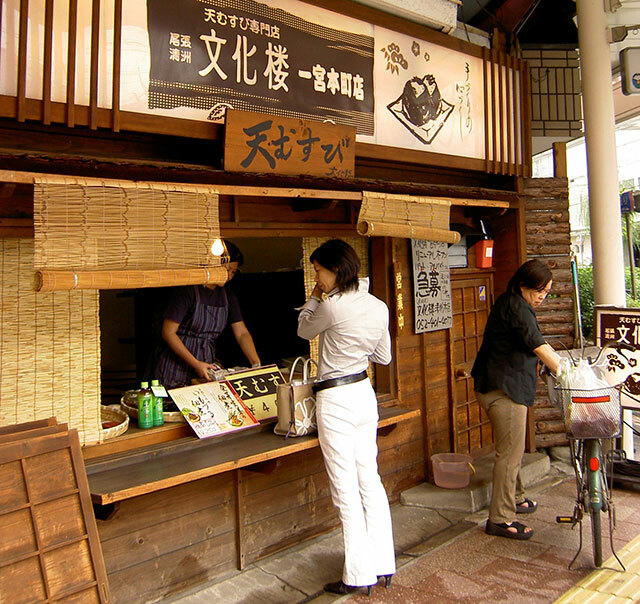 In the 1930s, a woman named Mrs. Mizutani owned a tempura set-meal restaurant called Senju in Tsu City. 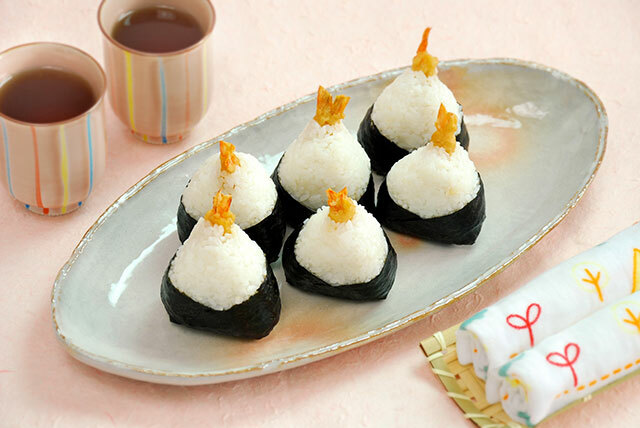 Legend has it that on a busy day, Mrs. Mizutani didn’t have enough time to prepare lunch for her husband, and gave him rice balls with cut pieces of shrimp tempura hidden inside. Her husband must have enjoyed it, because 20 years later, the shrimp tempura rice balls were being served not only to her husband but to restaurant employees as well. Patrons soon discovered the dish, and asked for it from the restaurant’s secret menu, until Mrs. Mizutani perfected her recipe and began offering it on the formal menu, where a woman named Mrs. Fujimori, who was on vacation from Nagoya, ordered it and loved it. Fifty years later, in 1980, the depressed economy in Nagoya led Mr. Fujimori, the patron’s husband, to close his watch shop. Mrs. Fujimori began exploring ways to support her family, and thought to sell the tenmusu that she loved from Mrs. Mizutani’s restaurant as a new item in Nagoya. She visited Mrs. Mizutani, and was rejected. She kept coming back, and was rejected. And she was persistent, even staying with Mrs. Mizutani, and finally gained her friendship. Through her persistence, friendship and negotiation, Mrs. Mizutani taught her the recipe and allowed her to open a branch of Senju in Nagoya. Tenmusu was unknown in Nagoya, but after all that Mrs. Fujimori had gone through, she began a marketing campaign that gained her much publicity, and tenmusu became famous as a Nagoya specialty! Both the Tsu City and Nagoya restaurants are still in existence, and you can see a sign that says “ORIGINAL” outside of the shop in Tsu City. We love tenmusu at Zojirushi, too, and our recipe is as tasty as the ones from the original shop! The best part about tenmusu is eating it in and around Nagoya. While trying out new foods may be one of the most interesting things to do in Aichi Prefecture, we know you’ll also love visiting the many spectacular attractions in the area, including the Mikawa Bay Quasi-National Park, the 1,900 year old Atsuta Jingu Shrine, Inuyama Castle and the Minamichita Hot Springs Resort. If you’re fortunate enough to be in Aichi Prefecture in winter, don’t miss the Hadaka Matsuri or “naked festival”… it’s a 1,200 year old tradition! We hope you love Aichi Prefecture as much as we do, and as always, try making tenmusu and tell us how it went! Our classic Mr. Bento® Stainless Lunch Jar gives you a great way to carry delicious food with you to work, school or wherever you’re on the go! 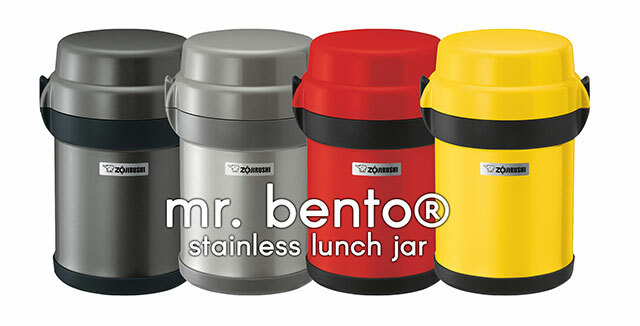 The Mr. Bento® Stainless Lunch Jar comes with a vacuum insulated outer container that holds four inner bowls, which can keep both hot or cold items fresh and ready to eat. 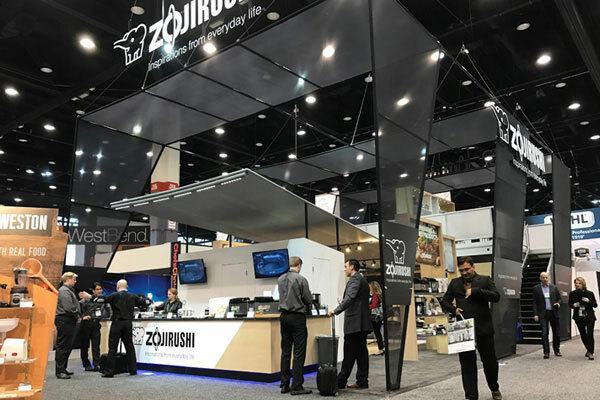 The outer container uses double-walled stainless steel construction with Zojirushi’s superior vacuum insulation technology. The soup bowl and the main bowl fit inside the insulated part of the container, and the two side bowls fit above, keeping food at room temperature at the top of the container. 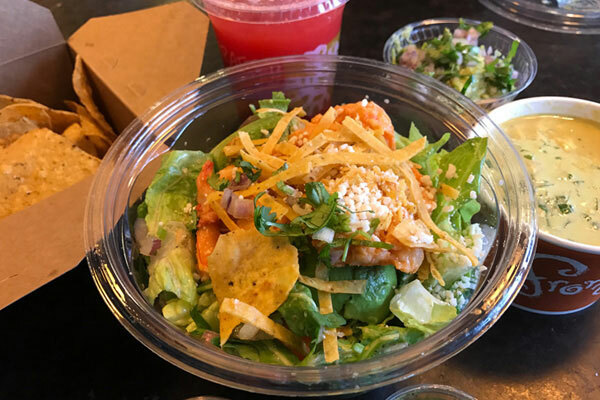 The soup bowl holds up to 9 ounces, the main bowl up to 15 ounces, the large side bowl up to 10 ounces and the small side bowl up to 7 ounces, perfect for a snack! Each of the inner bowls are microwaveable once the lids are removed and BPA-free. When placed inside the outer container, the inner bowls present several options for storing various types of foods and keeping them hot or cold for hours. The soup bowl can hold liquids, such as broths, stews and soups. The gasket inside the lid creates a tight seal on the bowl, minimizing leaks. The valve on the top of the lid allows you to release pressure that might have built up from hot liquids and foods, making the lid easier to remove. The main bowl’s large interior holds your entree, such as meat, noodles, rice or whatever else you’re craving. 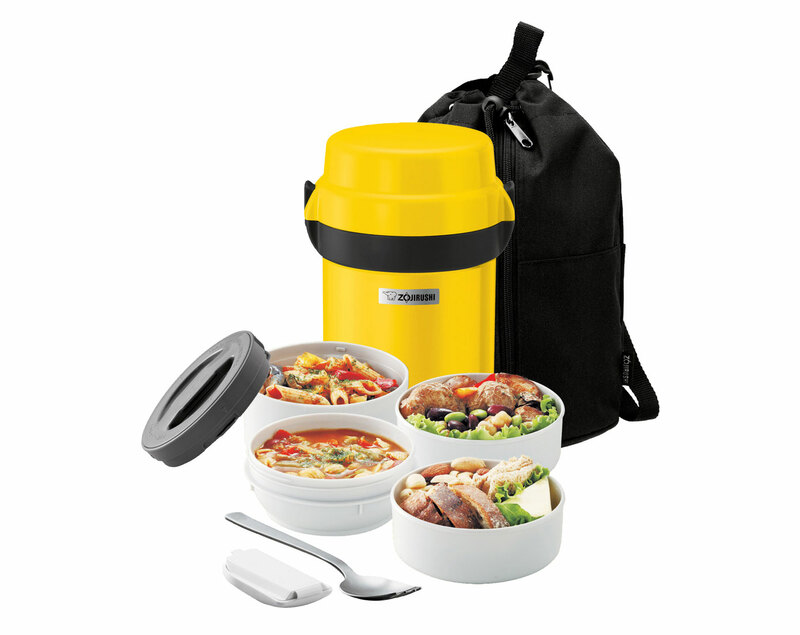 It comes with an insulated lid that prevents heat or cold from radiating to the side bowls. The side bowls are perfect for foods kept at room temperature, like fruits, nuts or crackers, making it easy to take food for the entire day! The vacuum insulated outer container is made of two layers of durable stainless steel. The air between these layers has been removed to create an airtight insulation. And the interior of the container is nonstick coated, making it easy to clean. The inner bowls are easy to clean as well… just use mild dish detergent and warm water. Once all of the bowls are inserted into the outer container, just snap the lid onto the outer container and you have a single unit that’s easy to take to work, school, or… wherever! The Mr. Bento® Stainless Lunch Jar also comes with a covered forked spoon and a stylish carrying bag. 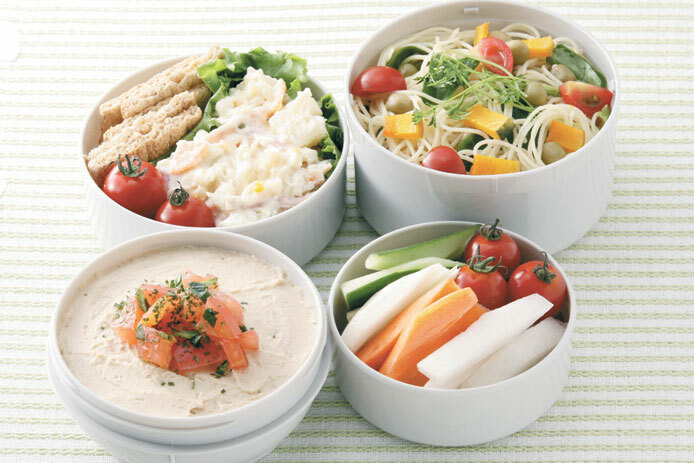 The Mr. Bento® lunch jar is perfect for well… bentos! With four inner bowls of varying sizes, the options are limitless, so we construct our bento the way we’d stack the bowls. We start with a Green Pea Soup, garnished with a bright splash of red bell pepper in the soup bowl. White rice fills the main bowl, which stacks on top of the soup bowl in the outer container. In the large sides bowl, we add crudité vegetables topped with a Tofu Hamburger. We cap the entire meal off with some fresh fruits and nuts, the perfect dessert to store in the small side bowl. Creating our bento makes us hungry… and we hope it stimulates your appetite, too! Try out the Mr. Bento® lunch jar for your next meal, and let us know how you fill it in the comments below. 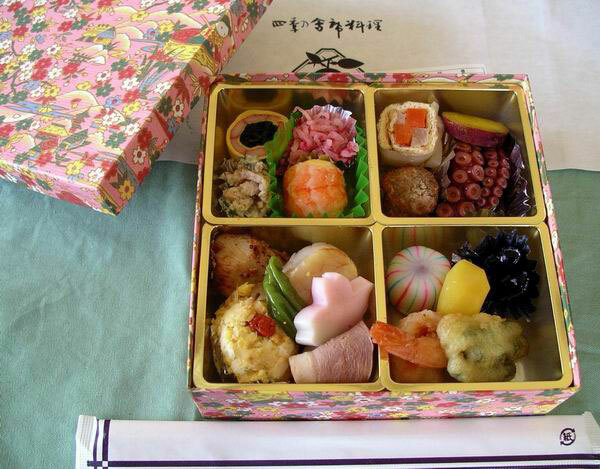 Japanese Bento – Cherry Blossoms Inspire Bento! 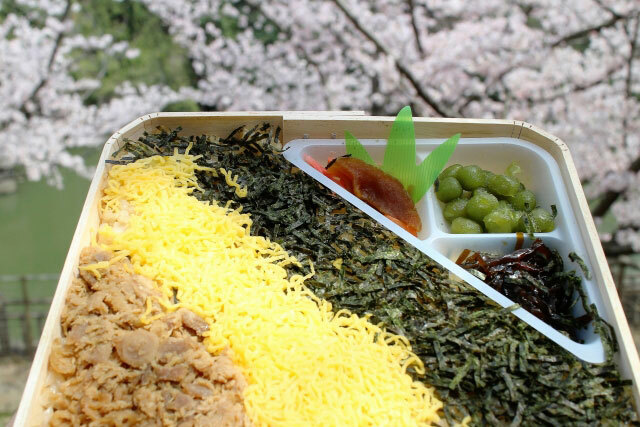 Spring is here, and with the blooming of cherry, or sakura, trees all over Japan, we’re excited to share in the season by exploring hanami bento! 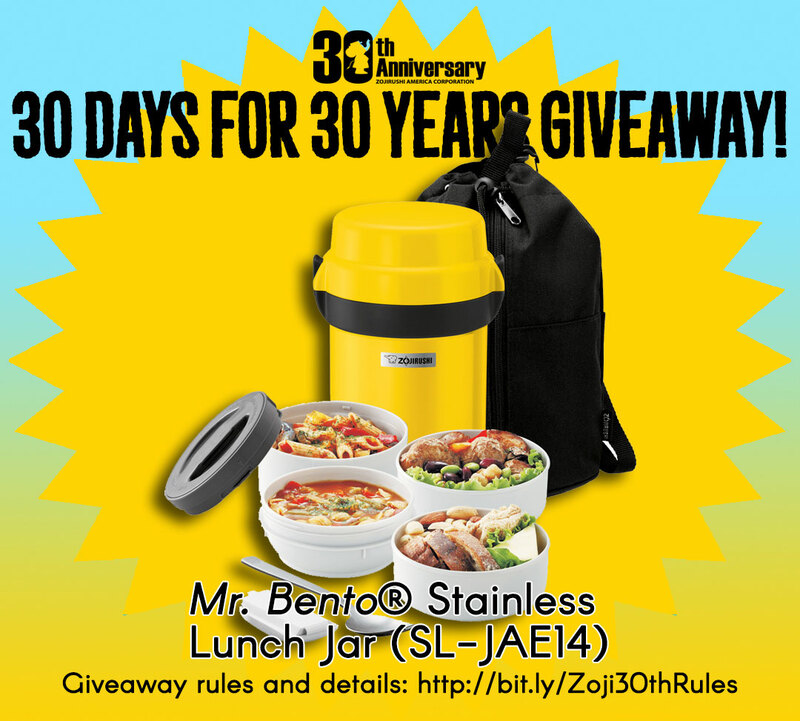 (…and stay tuned at the end to find out how to win a Mr. Bento® Stainless Lunch Jar!) THIS GIVEAWAY HAS ENDED. Spring in Japan brings a flurry of freshness… Japanese apricot, or ume, and cherry trees start flowering, signaling the change in season. Festivals begin, celebrating the renewal of life from a cold winter. And the new academic and business year begins. Fresh, seasonal foods are also prepared, and can be seen beautifully displayed in hanami bento. Hanami bento are named after the ohanami tradition of meeting up with friends, family and coworkers to view the blooming cherry blossoms and spend time outdoors in areas lush with the delicate pink blooms. The tradition of viewing the flowers is said to have begun sometime between the end of the Nara Period (710-794 AD) and the beginning of the Heian Period (794-1185 AD). The Emperor Saga welcomed springtime and the beginning of rice planting season in Kyoto by hosting parties under the sakura trees. Over time, the tradition spread from the aristocracy to the general populace, with people enjoying outdoor picnics and merriment from morning into the night. 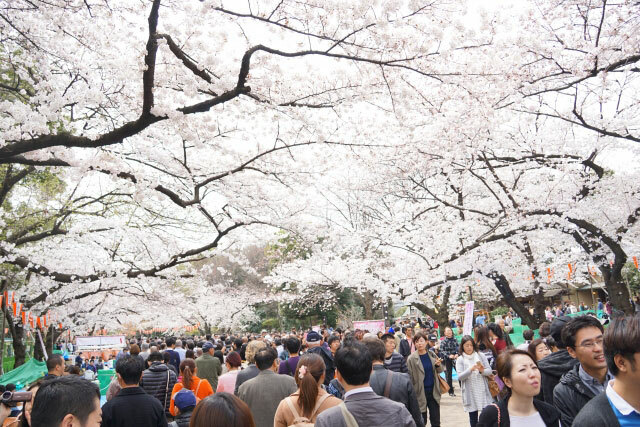 Today, enjoying the cherry blossom season is still a favorite custom in Japan, and many Japanese continue the tradition of ohanami parties in parks and private gardens throughout the country. In fact, local news broadcasts provide detailed accounts of where the flowers are blooming, and sakuramatsuri, or cherry blossom festivals, begin in cities like Hirosaki, Kyoto, Osaka and Tokyo, just to name a few. One of the most enjoyable aspects of cherry blossom viewing parties are the meals! Hanami bento are a type of koraku or large picnic bento specifically crafted with the sakura in mind, famously enjoyed during picnics. These larger bento boxes are made for sharing! 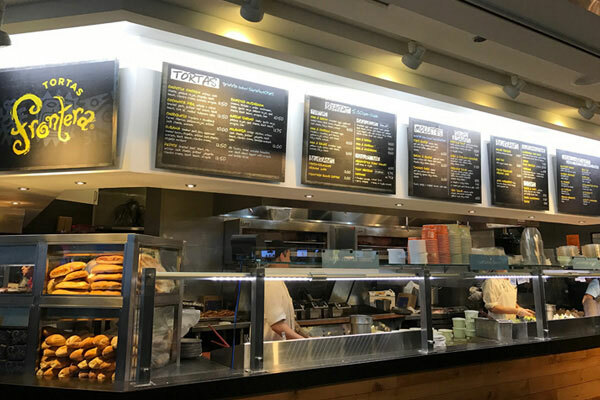 They’re filled with colorful, seasonal foods, including hearty items like rolled egg omelet, fish and shrimp, and mini-burgers and chicken karaage. Vegetables like carrots, asparagus and green beans are crisply cooked, cut and arranged so they look like the cherry blossoms. Seasoned rice, like sweet rice cooked with adzuki beans, are included and formed into flower shapes to add beauty to the mix. And of course, the bento wouldn’t be complete without some form of wagashi or sweets like tricolor dango called hanami dango. Hanami bento can be made at home and taken to cherry blossom viewing parties, and they can also be purchased from specialty shops and depachika, or the food halls in the basements of department stores. Depachika versions include traditional items, Western foods, and new, innovative combinations, as well! If you’re lucky enough to live in an area of the United States where cherry trees bloom, plan your own ohanami party and bring a bento! We love including mini-hamburgers with two sauces, a Japanese one made with soy sauce and mirin and a Western one with Worcestershire sauce and ketchup. We also love adding crisp veggies like aemono, made with fresh spring green beans. And the ever popular hanami dango, with white, pink and green sweets. We hope you enjoy your bento and let us know where you saw the blooming cherry trees! 30 Days For 30 Years Giveaway! *must comment before 11:59PDT on 04/04/2017 THIS GIVEAWAY HAS ENDED. 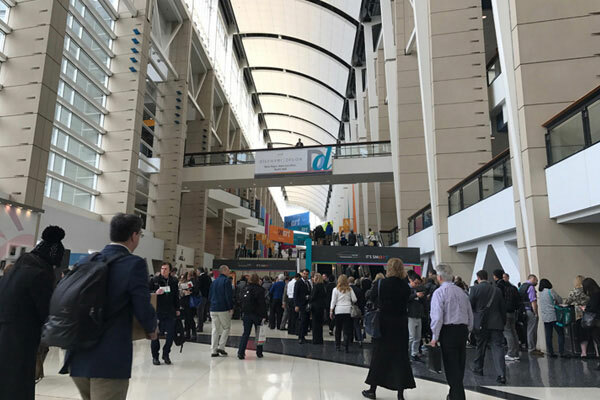 Every year, the housewares industry flocks to Chicago to attend a huge conference called the International Home + Housewares Show. 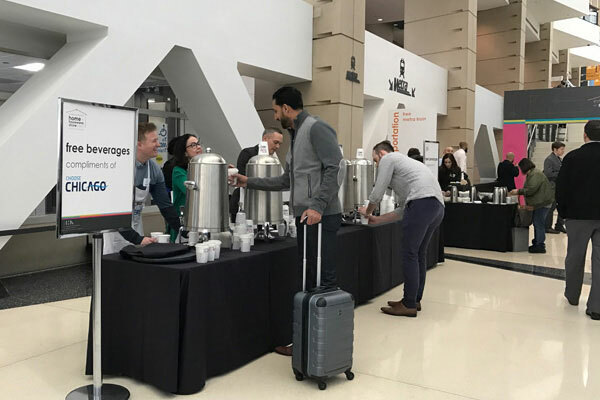 If you are in the kitchenware, home furnishings or cleaning products business, you’re probably either exhibiting your products or looking for what’s new at this show, walking the halls of the enormous, multi-level McCormick Place convention center. 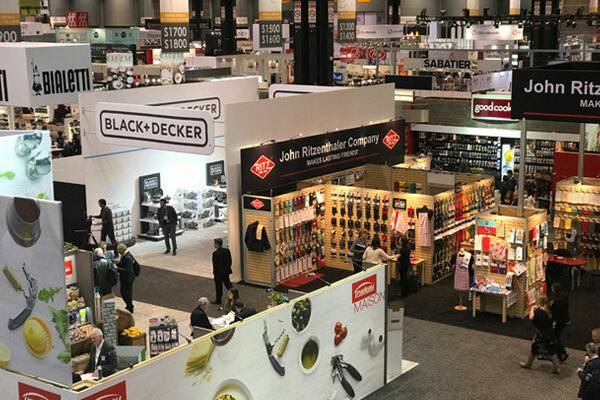 Since my day job is marketing and PR for a major kitchen gadget manufacturer, I’ve been going to Chicago for the past 7 years. Want a tour of what the Show looks like? Read on! Oh, and at the end, find out how to win a Zojirushi FreshBrew Coffee Maker! THIS GIVEAWAY HAS ENDED. As Frank Sinatra used to sing, Chicago is a cool town, and I love it. It’s a big city in every sense, and people move with a purpose and seem to work hard. Maybe it’s the weather; you can’t be soft and live here. 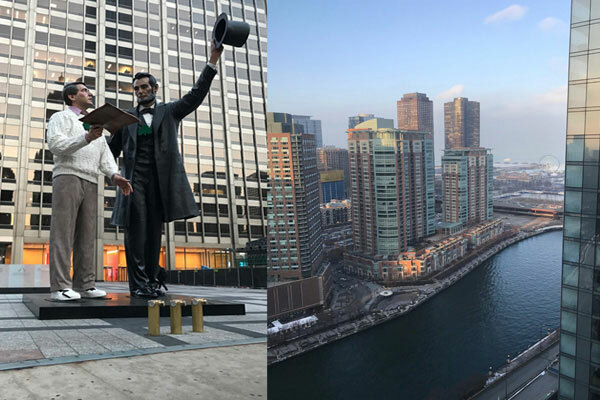 Scenes from Chicago: (left) Mr. Lincoln discusses the Gettysburg Address with a modern day man. (right) The Chicago River with a peek of Lake Michigan beyond. 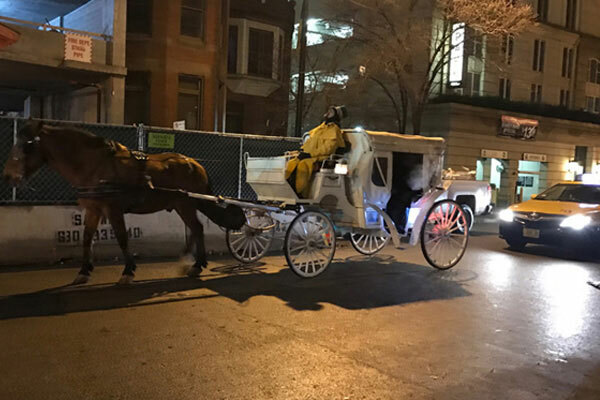 Getting around Chicago at night—either catch a carriage or catch a cab. It’s starting to get hectic. Day One, and people are just starting to stream in. A bank of coffee servers greets the guests. The escalators get a lot of work. Entrance to the great South Hall, where all the kitchenware manufacturers are exhibiting. 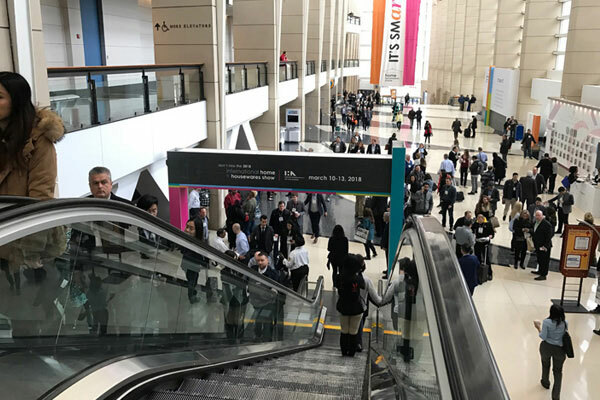 With over 2000 exhibitors in 3 different halls, it’s nearly impossible to see what everyone has to offer in just 4 days. 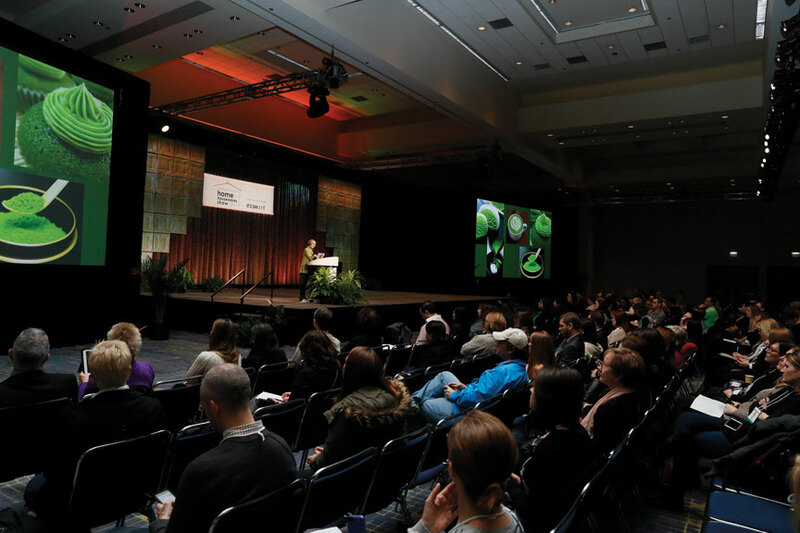 There are also panel discussions, seminars, cooking demonstrations and live events happening everywhere! A bird’s eye view of the floor. 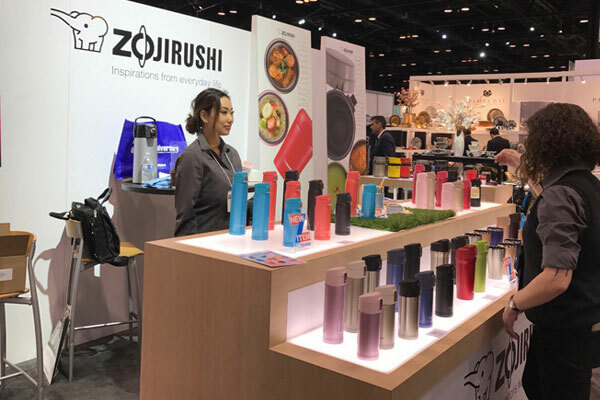 This is a smaller booth that Zojirushi has in this section of the Show, to show their line-up of travel mugs and lunch jars. So many manufacturers had some kind of hydration product this year, it was as if everyone finally got on the same train Zojirushi has been engineering for decades! The girls are making sure everything is perfect for when the doors open. Rick Bayless is about to do a cooking demonstration at the KitchenAid Station. Ming Tsai, who also is scheduled to do one here, jokes around and is giving Rick a hard time. Chef Bayless is famous for his modern takes on traditional Mexican cuisine. Almost every renowned chef comes to this Show, either to promote their own restaurant or to show off their brand of kitchenware. All the chefs greet each other at the Show by their titles, which is always, “Chef”. 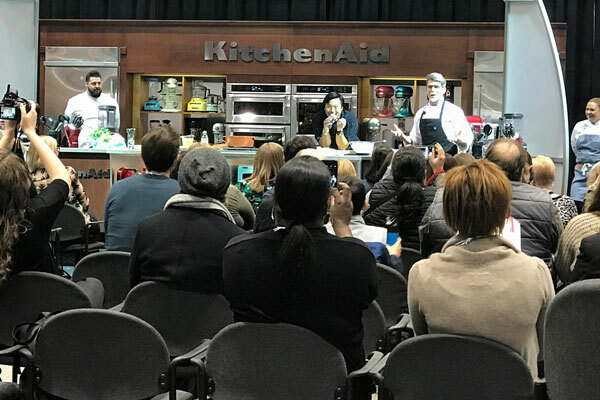 Cooking demos are held everywhere at the Show, including at individual booths sponsored by the manufacturer, onstage and in banquet rooms for invited guests. This hall is mainly for home furnishings and cleaning products. If you want to see the latest in vacuum cleaner technology or self-opening trash cans, this is where you want to do your research. 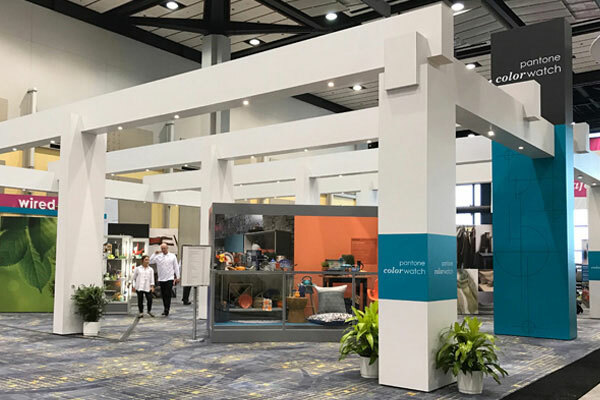 One of my favorite companies, SimpleHuman, who design really nice high-tech furnishings for the kitchen and bath, had a booth this year completely enclosed in a shiny black cargo container. Awesome! 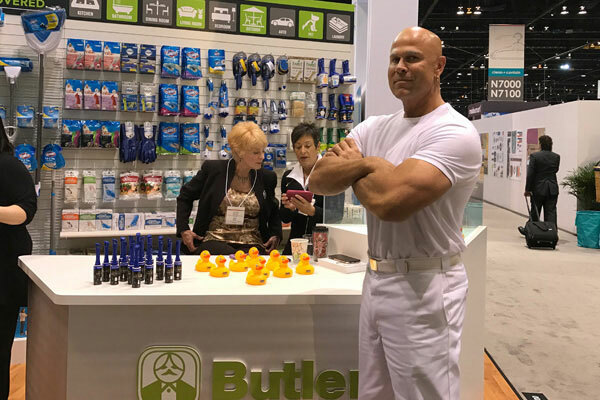 A familiar icon: Mr. Clean! Food at any convention center always leaves a lot to be desired. 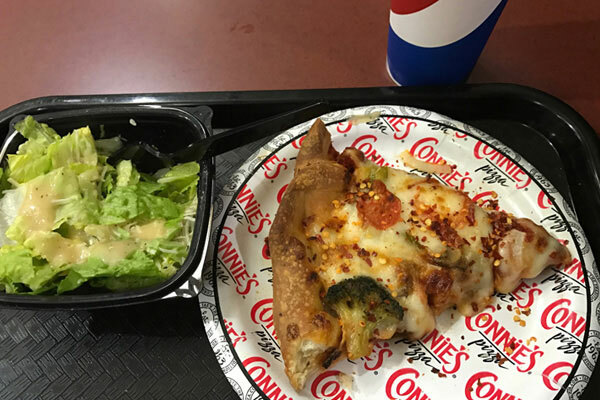 My vote for best bet at McCormick is Connie’s Pizza. They’re pretty good and it’s better than the McDonalds right across it. A quick slice of veggie pizza and a salad. Color trends are important in our industry. And who better than Pantone to set the trend, right? Announcing the Color of the Year at the Pantone presentation. Gasp! It’s going to be GREEN! 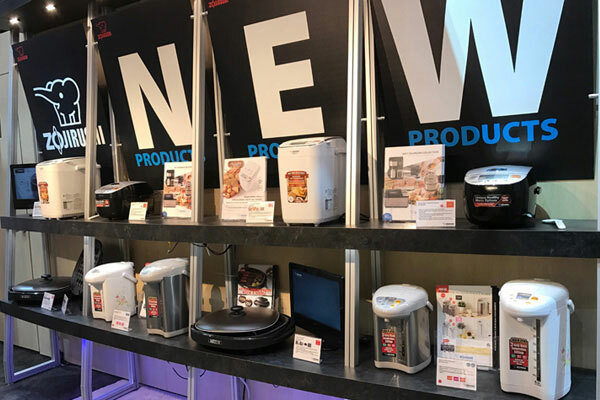 Zojirushi has their main booth in a section called the Lakeside Center, along with other small electrical appliance manufacturers like Kreurig, Cuisinart, KitchenAid, etc. I like the open airiness and stylish design of their booth, don’t you? The girls out front are busy the whole day cooking and passing out samples. 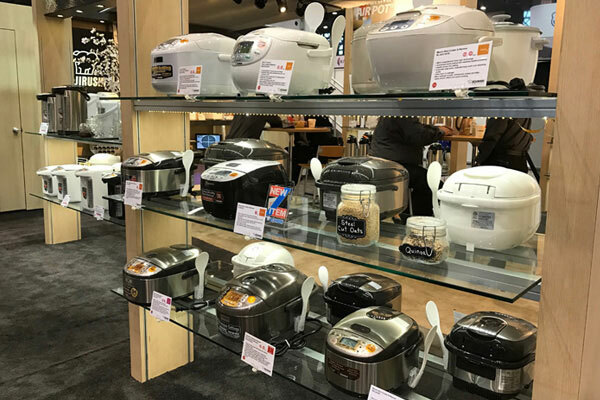 A line-up of rice cookers on display. A shelf of NEW products being introduced to the world. Be sure to follow Zojirushi to learn more! On my last day in Chicago, I decided to try Chef Rick Bayless’s Frontera Grill. This is his tortas stand inside O’hare airport. The food was excellent, by the way. For airport food, this is an impressive and extensive menu. Taqueria salad, Corn & Poblano Chowder, Guacamole and Chips. Everything was really tasty; his guacamole is outstanding! 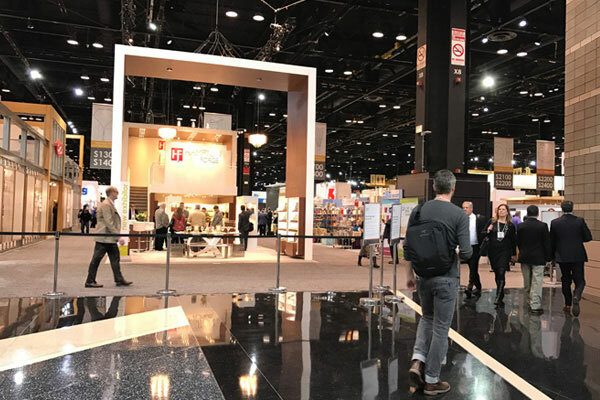 Hopefully you enjoyed the peek inside the workings of the housewares industry; it’s a huge conference and cannot be covered in a single article. 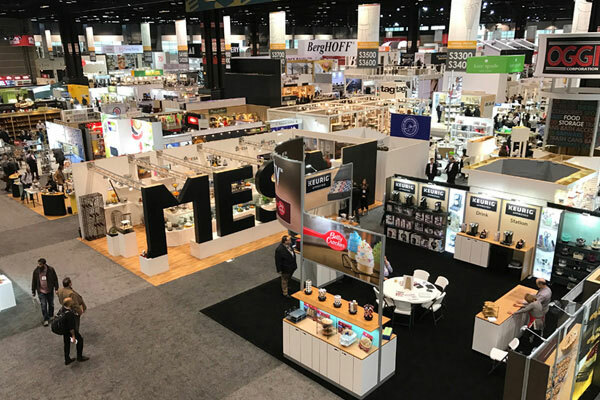 This year’s show featured 2204 exhibitors from 47 countries, attended by over 62,000 housewares professionals in 4 days. 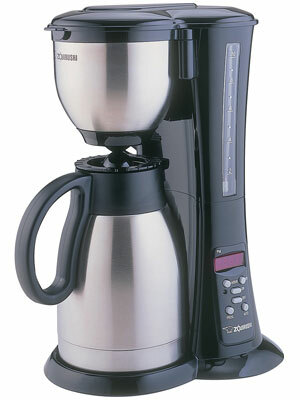 Write a comment on my post for a chance to win this Fresh Brew Coffee Maker from Zojirushi! That’s all you have to do—so easy! Good Luck!